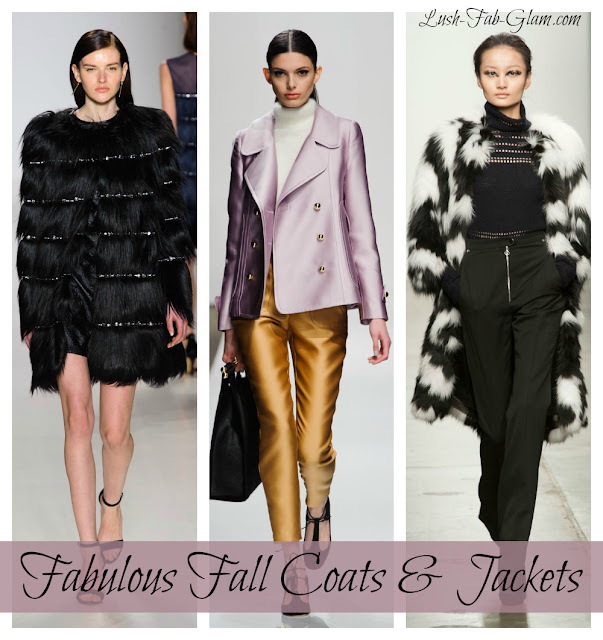 Lush Fab Glam Inspired Lifestyle For The Modern Woman: Fabulous Coats And Jackets For Fall. Fabulous Coats And Jackets For Fall. We fell head over heels in love with the coats and jackets featured on the runways of fall 2015 fashion week. Now that the fall season is officially here and our favorite sites and stores are all stocked up with these runway inspired fall fashion trends, it's time to go shopping for our outerwear must-haves. Look 1: From weekend escapades to nights on the town a short jacket with a metallic lustre is the perfect piece to complete your casual chic look. Look 2: Be professional yet stylish at the office with a chic below-the-knee trench coat. Shop This Look. Look 6: Or personalize the trend to your own tastes by choosing a mutli-color/pattern fur/faux fur coat like this neutral black and white stripes coat. Which featured fall coat/jacket do you love? Share with us by leaving a comment below.